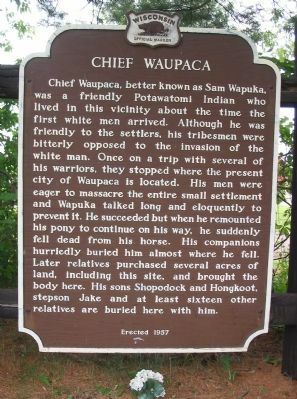 Chief Waupaca, better known as Sam Wapuka, was a friendly Potawatomi Indian who lived in this vicinity about the time the first white men arrived. Although he was friendly to the settlers, his tribesmen were bitterly opposed to the invasion of the white man. 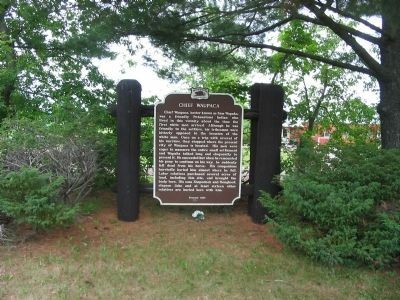 Once on a trip with several of his warriors, they stopped where the present city of Waupaca is located. His men were eager to massacre the entire small settlement and Waupaca talked long and eloquently to prevent it. He succeeded but when he remounted his pony to continue on his way, he suddenly fell dead from his horse. His companions hurriedly buried him almost where he fell. Later relatives purchased several acres of land, including this site, and brought the body here. His sons Shopodock and Hongkoot, stepson Jake and at least sixteen other relatives are buried here with him. 88° 53.991′ W. Marker is near Marion, Wisconsin, in Waupaca County. 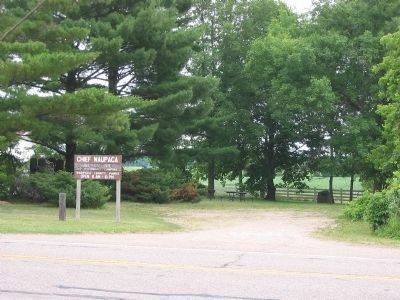 Marker is at the intersection of State Highway 110 and Schoneck Road, on the left when traveling south on State Highway 110. Touch for map. Marker is by a small parking area. Marker is in this post office area: Marion WI 54950, United States of America. Touch for directions. Other nearby markers. 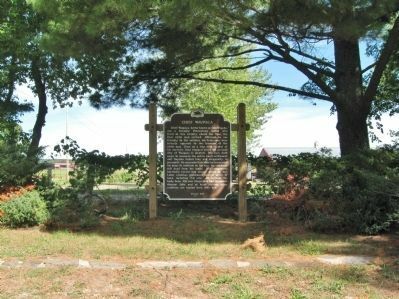 At least 7 other markers are within 11 miles of this marker, measured as the crow flies. History of Big Falls (approx. 5.7 miles away); Clintonville Veterans Memorial (approx. 6.8 miles away); Veterans Memorial (approx. 6.9 miles away); Portion of Wall of China (approx. 6.9 miles away); Four–Wheel Drive (approx. 7 miles away); Birthplace of an Airline (approx. 8.3 miles away); Melvin O. Handrich (approx. 10.7 miles away). The posts have been replaced. Marker is at the left edge of the photo. More. 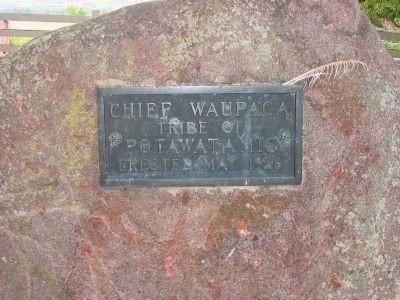 Search the internet for Chief Waupaca. Credits. This page was last revised on June 16, 2016. This page originally submitted on July 8, 2009, by Keith L of Wisconsin Rapids, Wisconsin. This page has been viewed 1,410 times since then and 21 times this year. Photos: 1, 2. submitted on July 8, 2009, by Keith L of Wisconsin Rapids, Wisconsin. 3. submitted on January 8, 2014, by Keith L of Wisconsin Rapids, Wisconsin. 4, 5. submitted on July 8, 2009, by Keith L of Wisconsin Rapids, Wisconsin. • Craig Swain was the editor who published this page.